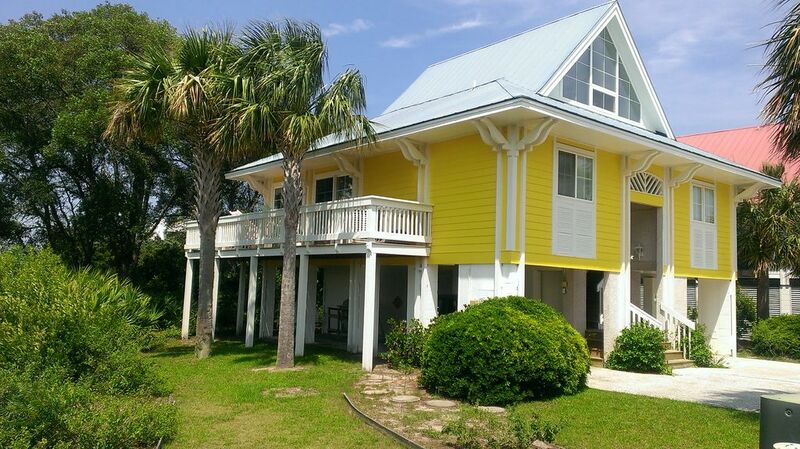 Beach/River/Canals/Marsh & Golf Cart Included ! Minutes to the B each. Comes with its own 4 passenger Golf Cart for easy access to all the islands amenities and views.. There are 3 Bedrooms. 2 downstairs each with their own queen size bed and upstairs there is a Loft Bedroom with 1 full and 2 twin beds. All beds are freshly made before your arrival and are of high quality for a good nights sleep. The upstairs bedroom has a separate 32 inch LED TV and Sony BlueRay Player making it great for kids and adults The family room has 4 large sliding glass doors offering unobstrustive views from inside where you can see the shrimp boats huge the shoreline along Harbor River and the Sunset that pours its evening colors into the room also the saltwater tidal creek that runs beside our home and it also has 40 inch LED TV and Sony BlueRay. Both Blue Rays provide access for HULU, NETFLIX, ROKU AND MORE. The house has its own cable Internet WiFi. About the area: We are located just 2 short miles from the entrance to Hunting Island State Park.. South Carolina's most visited State Park offering its own Lighthouse, Beach and Fishing pier. The area is surrounded with many exceptional golf courses located just a few minutes drive such as the renowned PGA champion Davis Love III's signature Ocean Creek only 10 minutes away as well as the George Cobb designed Ocean Point which offers spectacular oceanfront views along its challenging holes. Day trip visits to Hilton Head SC 40 minutes, Savannah GA 1 hour and Charleston SC 1 hour 40 minutes. The area is rich in history, culture, nature and more. House and Island: Key West designed tropical island home has wonderful unobstructed views featuring the Harbor River, Harbor River Swing Bridge, Marsh. There is a saltwater tidal canal which is connected to the property and provides access for Fishing and Crabbing at the house. Also the views of the Sunset from the family room of the house are spectacular. As you can see from the photos the house has plenty of windows and fills with natural light. Minutes to the beach and comes with its own 4 passanger Golfcart for easy access to all the island has to offer. There are 3 bedrooms. 2 downstairs each with there own queen size bed and upstairs there is a bedroom with 1 full and 2 twin beds. All beds are of high quality for a goodnights sleep. The upstairs bedroom has a seperate TV and BlueRay making it great for kids or adults. The family room has 4 large sliding glass doors offering the best views from inside where you can see the shrimp boats huge the shore. More about House and Island: The Sunset poors its evening colors into the room. On the 4th of July the upstairs view facing towards the front of the house offers a surprising view of 3 seperate firework displays featuring Beaufort, Parris Island/Port Royal and Hilton Head. There are two full baths with plenty of towels and linens. The kitchen is fully stocked with plates, pans and most everything you will need. There is a Front Loading Washer and Dryer for laundry. Outside there is a seperate shower to wash and rinse off from your outdoor fun. We love our beautiful home and keep it well maintained. Hope to have you visit and enjoy it too.This is strickly a no pets allowed home. (We understand your pets are part of your family but since we do state no pets it would not be fair to other renters especially those who have pet allergies to allow pets). Thank you for your understanding. .
Quiet area of Island. Unobstructed Views. Fish and Crab right outside your door. Beautiful Sunset Views. Personally Maintained between Renters by Owners. When you arrive in each bathroom there will be 12 towels, hand towels and wash clothes also 3 double rolls of quality toilet paper, a hair dryer, liquid handsoap..
Harbor River. Forest Gump ( Shrimp Boat Scenes ) was suppose to be the Mississippi but was actually Harbor River. Harbor River, Water Marsh and Tidal Creek that runs besides our home. Tidal Canal. Can Fish and Crab right at the house. Beds All Make and Ready for your arrival and backup sheets provided. Covered Parking for 2 vehicles in bays under house. Max Parking for residence 4. 24 Towels, 24 Wash Clothes and 24 Hand Towels. !2 each per bathroom. 12 Cup Mr. Coffee and Keurig Single Serve. Sugar, Coffee, Salt, Pepper Seasonings. Trash Bags, 1 over sized back up Roll Paper Towels plus 1 on Dipenser, Dish Washing Detergent (both hand and machine}, Laundry Detergent and more. 2 Sony BlueRay with access to your Hulu, Netflix, Amazon, Roku Accounts and More. Under Elderly or Infirmed the reason I state the house maybe unsuitable is due to the fact all the homes on the island are raised so require stairs to access. There are a few homes that have elevators and the villas (but they also require a few stairs to access). This was our second stay at the property. It was very clean and well stocked. The kids loved the upstairs bedroom and the golf cart. The owner is great to work with. We were sad to leave but we will be back!!! We spent a week at Frank’s property and were delighted. Fully stocked with linens and other essentials, with a quaint surf and sandwich shop just up the road. We were able to easily spend a day in Savannah when we didn’t have beach weather, and plenty of great seafood abounds! Would gladly stay again. Thank you for your review it was a pleasure having you visit. We switched to this home midway through a disappointing rental in town. Frank, the owner, was extremely helpful in arranging this last-minute booking and in making sure everything was comfortable for us once there. The house is extremely clean and well-stocked. Coffee, condiments, all the cooking supplies you'd need. Comfortable beds and all new furniture in great condition. The location is not the best on Harbor Island, but the development is pretty small and it's very easy to get to the beach or pool with the golf cart provided (or in your own car). This is a great value, and we'd rent again, without question. very well maintained and stocked home. Location was perfect with the area being quiet so we felt as if we were there alone. Home is stocked with EVERYTHING you could possibly imagine. Thanks to the owners for being so thoughtful. we will definitely return again! Enjoyed our stay on this lively house. Plenty of beds, so nobody had to share. Beds were comfortable, plenty of pillows. Kitchen was very well stocked and lots of spices were provided. We had worried the stairs would be too steep for my elderly mom, but they were okay. Golf cart was very convenient to get around the island and to the pool. Best of all was the Hunting Island State Park pass. Loved the park, the beaches, and the lighthouse. Frank was very easy to communicate with, and deposit was returned in a timely manner. Hope to return someday. A wonderful house on a beautiful, quiet island. The wildlife there was amazing. The views were breathtaking. The golf cart made for easy access to the pool and beach. The house was very comfortable and beautifully decorated. The pass allowing access to Huntington Island was a valuable extra included. Golf: The area is surrounded with many exceptional golf courses located just a few minutes drive such as the renowned PGA champion Davis Love III's signature Ocean Creek only 10 minutes away as well as the George Cobb designed Ocean Point which offers spectacular oceanfront views along its challenging holes. Rate includes Taxes and 1 Daily Vehicle/Gate Pass Additional Vehicle / Gate Passes are $11.55 Daily or $69.30 weekly (required per vehicle) Check-in 4 p.m. Check-out 10 a.m. Additional Vehicle/Gate Passes Rates vary due to but not exclusive to holidays and # of guest. We do not allow more than 8 guest. No Pets No Smoking We do not allow smoking inside residence. Security Deposit Required.